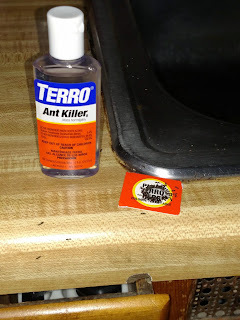 We've had more ants in our house than usual this spring. They created an ant superhighway along our kitchen counter to the sink. If I reached up to the cupboard wearing a loose shirt, a few would hop on. Eventually, I started thinking every little itch I felt was an ant crawling on me. Before I went insane, I decided it was time to end this. It was time for Terro Ant Killer. Look at those poor bastards lapping up that sweet, deadly sauce. Within two days, our ants have virtually disappeared.